I've been SUPER busy today editing photos from a wedding last month, editing photos of a pregnancy anouncement and working on 8 different custom signs! Shew! This girl is beat! So here's what you'll need! -Fabric, any kind you wish! 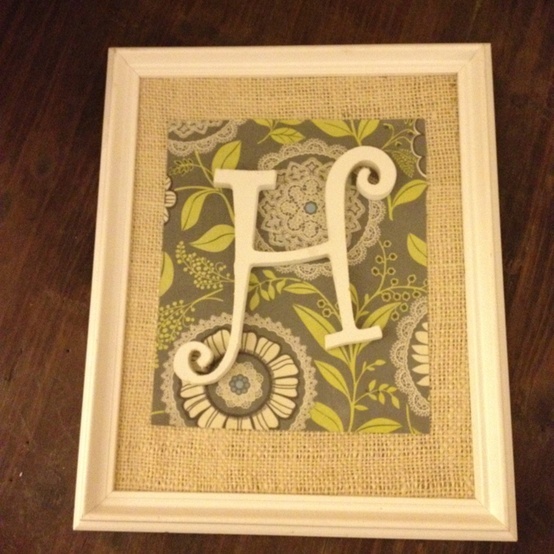 Everything I for this project I had on hand except the frame & letter so it only cost me $3.00! You could still easily do this on any budget for under $10.00 or $15.00. Easy. This I consider to be one of the easiest projects I've done to date. I got it all done in 10 minutes or less. The first step that I did was tape off how I wanted my stripes to be. I used my painters tape to do as shown. When you are painting stripes, a good tip to get a nice, clean line after you remove the tape is to paint the tape too. Yes, paint the tape. I sanded the front down for a nice smooth finish but this isn't really necessary. I also slightly distressed it which you also don't have to do if you don't wish. 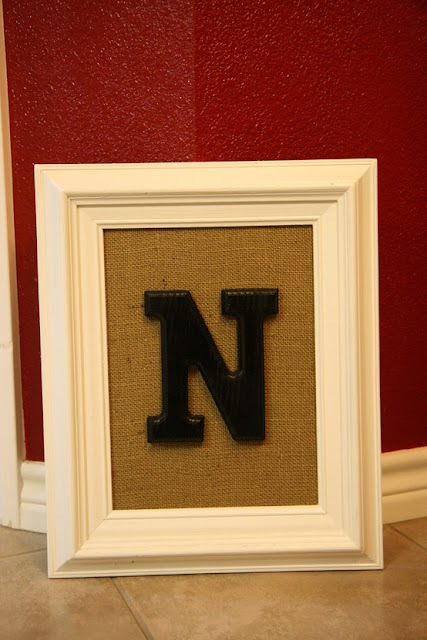 Now, you don't even have to glue your fabric to the cardboard that comes with the frame but I did! As you can see, I had alot of excess fabric but I would rather have been safe than sorry. I had about 2 inches all around. I simply took scissors & cut it down more. Take the prongs on the back side and put them back down to hold the fabric securely in place. Remember if you're using any kind of fabric to make sure it isn't too loose on the front and to also make sure that it isn't too tight where the fabric is laying uneven. 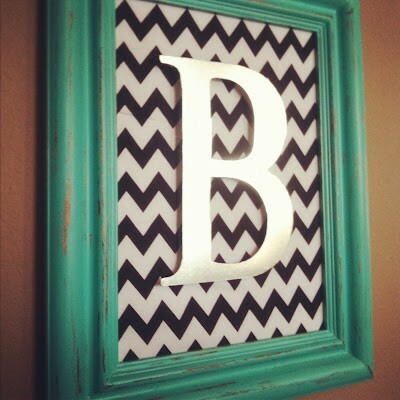 So, what do y'all think of my DIY letter picture frame? Totally easy right? And it only cost me $3.00! I would love to see if you try this so make sure to show me on Facebook. 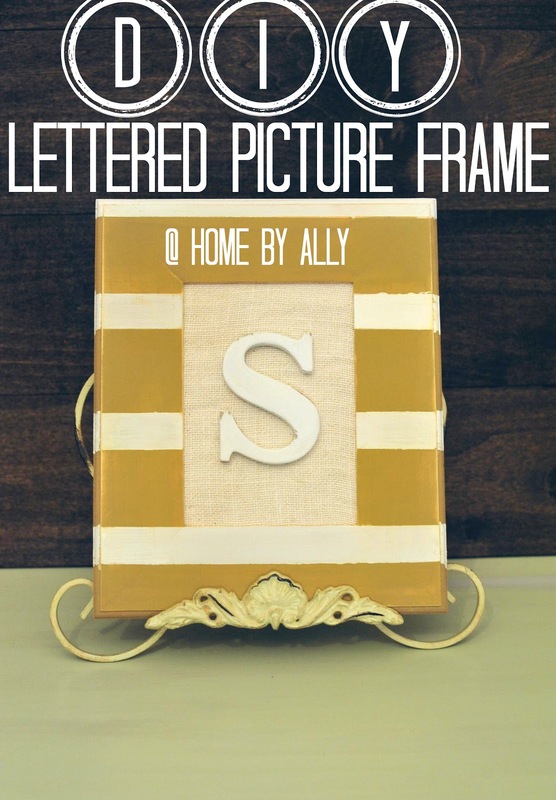 To "LIKE" Home by Ally on Facebook, click HERE. Also, make sure to click "follow" over to the right! And if you don't have a blogger account, simply add your email over there to the right as well so you can stay up to date on everything "HOME BY ALLY." Talk to y'all really soon! Omg Ally! This looks so easy to do! I have seen people selling these but gosh how simple! Thanks I may be making some for Christmas gifts!!! How much would you say one of these costs to make yourself? I nominated you for the Liebster Award! You are amazing!